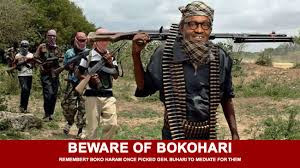 The Congress for Progressive Change (CPC) presidential candidate in the 2011 election, Maj-Gen. Mohammadu Buhari, yesterday described the war against the Boko Haram sect as injustice against the North. Buhari spoke as “Guest of the Week” on Hausa programme of Liberty Radio, Kaduna. He said special treatments were given to the Niger Delta militants by the Federal Government, while the Boko Haram members were being killed daily and their houses demolished. The former Head of State said he was not in support of the emergency rule declared in Borno, Yobe and Adamawa states because President Goodluck Jonathan failed from the onset in addressing the nation’s insecurity. Buhari said the security challenges confronting the country started in the Niger Delta where he alleged that politicians desperate to retain their positions recruited youths and armed them to win elections by force. He said: “What is responsible for the security situation in the country is caused by the activities of Niger Delta militants. “Every Nigerian that is familiar with happenings knows this. The Niger Delta militants started it all. What happened is that the governors of the Niger Delta region at that time wanted to win their elections, so they recruited youths and gave them guns and bullets and used them against their opponents to win elections by force. “After the elections were over, they asked the boys to return the guns, the boys refused to return the guns. Because of that the allowance that was being given to the youths by the governors during that time was stopped. “The youths resorted to kidnapping oil workers and were collecting dollars as ransom. Now a boy of 18 to 20 years was getting about $500 in a week, why will he go to school and spend 20 years to study and then come back and get employed by government to be paid N100,000 a month, that is if he is lucky to get employment. “So kidnapping becomes very rampant in the South -South and the South-East. They kidnapped people and were collecting money. “How did Boko Haram start? We know that their leader, Mohammed Yusuf, started his militant and the police couldn’t control them and the army was invited. He was arrested by soldiers and handed over to the police. “The appropriate thing to do, according to the law, was for the police to carry out investigations and charge him to court for prosecution, but they killed him, his in-law was killed, they went and demolished their houses. “Because of that, his supporters resorted to what they are doing today. You see in the case of the Niger Delta militants, the late President Umaru Musa Yar’adua sent an airplane to bring them, he sat down with them and discussed with them, they were cajoled and they were given money and granted amnesty.